I don’t have many heroes. Most of mine were accumulated in childhood, a time when that designation perhaps has fewer and less rigourous criteria. Having grown up in Montréal in the 1970s, Ken Dryden, Maurice “The Rocket” Richard, and Pierre Trudeau were mine. As adults, I think we have a higher threshold for calling someone a hero. There are people we respect or admire, and may even seek to emulate. But hero? That takes a little more effort. We are lucky to work in a profession whose history provides many examples of heroism. A few of those heroes are well-known, such as Sir William Osler and Norman Bethune. But I suspect that most physicians who have performed heroic deeds have gone largely unnamed. I would like to place the spotlight on someone who I think deserves to be called a hero. Dr Deirdre Duffy’s day job is in Red Deer, Alberta. 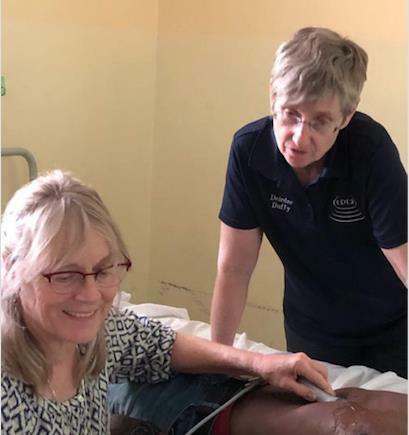 But Deirdre has spent considerable swathes of time over the last many years working in the developing world to help physicians and other health-care personnel from different countries move medical care forward. Of late, there has been a POCUS angle to her work. Here is the latest update that Deirdre sent me, no edits. 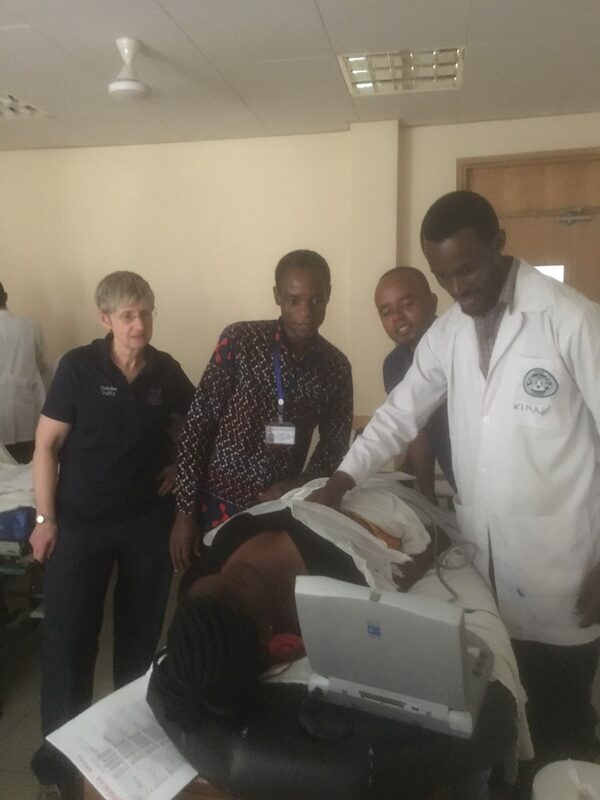 By the way, if you are interested in heading off to help teach POCUS overseas, you can contact Deirdre at deirdreduffy@hotmail.com. Where to start? Probably with the plane crash, I suppose. 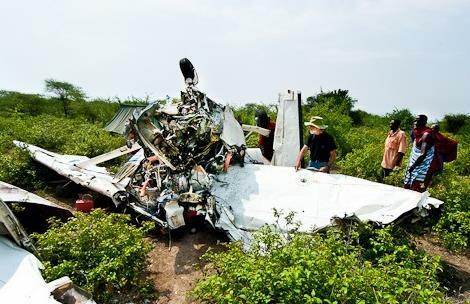 Back in 2014, I was in Tanzania sitting with a group of doctors talking to Pat Patten at the Arusha Flying Medical Service base about his operation, when a call came in from the Maasai at Ngongonero that the clinic plane had crashed with five people on board. No more information. What could be better for an ED doc crazy for flying? Need help? Pick me! Pick me! It was a Scoop and Fly scenario with us ending up in the Emergency Department of the Arusha Lutheran Medical Centre where we arrived to overwhelm them. Dr. Peter Mabula, then a junior doctor, was on shift and was happy for help. We liberated the X-ray department ultrasound machine, an old Sonosite Titan with a single curvilinear probe, cord alarmingly reinforced with tape and added bedside ultrasound to the assessment. Then I met Dr. Wendy Wilmore, a Canadian surgeon who had just two months previously arrived to develop a surgical residency program at the hospital and left the patients in her capable hands. Cut to 2016, I’m working with AMREF Flying Doctors in Nairobi and across the bar at the East Africa Flying Club I spy none other than Pat Patten. “ Hi Pat, how are things in Arusha? How did those crash victims make out? Do you know if they ever got any training in bedside ultrasound at the hospital?” “Let me put you in touch with Wendy” he said. Wendy was not really swept away by my offer to help with training! She acknowledged it was a big need but they had already had training from various visiting doctors and it simply wasn’t all that useful. “People come with a machine and show us neat things you can do with ultrasound. Then they leave, and nobody feels confident or competent enough to do it themselves”. I countered, ”What I have in mind is less Show and Tell and more Pyramid Scheme Mathematics.” I gave her a brief history of how EDE and CPOCUS (then named CEUS) had successfully retrofitted emergency doctors in Canada with POCUS capability and before you could say FAST she was on board. So how does this work? There are four pillars on which it is built, each essential to success. Training that actually works, is world class and internationally recognized. These folks are trying to save lives often with diagnostic equipment that is either not there, not working, or the patient can’t afford to pay for it. When we can make them competent at basic POCUS applications it enormously increases their ability to function. The CPOCUS community support. “The EDE course” makes the online basic course available free, CPOCUS waives fees for membership and certification of IP’s and EDE2 allows us to use their materials for advanced courses. No one in a resource-limited place could hope to be able to pay for all that. Where has all that got us? Well now after 4 visits we have 40 EDE 1 graduates, 20 IPs of whom, 15 have instructed at least one course/ bootcamp. 13 EDE2 critical care course graduates of whom 3 have further instructed at EDE2 and taken EDE2 diagnostic modules. And Wendy complains the machine is never in ICU when she looks for it because someone is using it elsewhere! That old Sonosite Titan still has its curvilinear probe wrapped in tape but they now have a sector probe also for EDE 2 cardiac scanning and as a back up when the old tape job finally gives way. Oh, and I hiked up Mt. Kenya, Mt Meru, Oldoinyo Lengai and Kili before I finally realized that all volcanoes have really steep sides and I should look for other vacation ideas. Lanice taking the EDE2 course as a student having helped teach the EDE1 course. 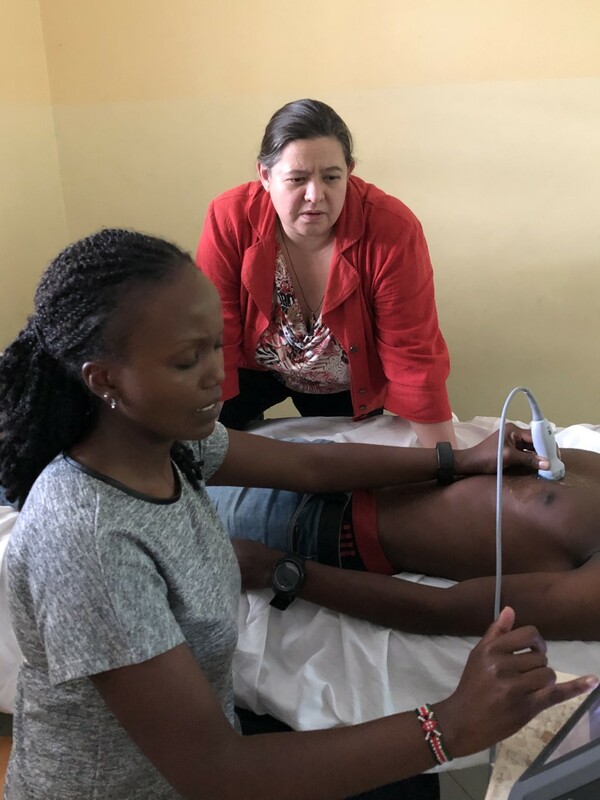 Lanice has in fact taken all of her POCUS training in Africa with the other students, paying it forward just like everybody else and schlepping the Sonosite Global Loaner machine around Africa. Collin Frank seen below took the EDE1 course on week one followed by bootcamp and CPOCUS exams to become an IP. He then instructed the second week EDE1 at the bedside and so gets to take the EDE2 Critical Care modules. Here Wendy Wilmore is seen teaching EDE2 to Jacqueline Kagima. Jacqueline is the exception to the “teach EDE first then take more EDE” rule. Based in ICU in Kenyatta National Hospital in Nairobi, she traveled to Arusha to take the course. She is paying it forward by organizing the next course in Nairobi in November and will instruct there instead. Well, they’re pretty pumped up in Nairobi to replicate the Arusha pyramid scheme and have put together a group of movers and shakers for our visit in November. All have had a mish mash of training and they want to find a system to standardize training in the country. It should be interesting as it is often easier to start with students who haven’t been exposed to other systems but they are all on board with the concept that to teach EDE they have to first take EDE. They are also keen on IP2 certification down the road so I have to get my head around how to achieve that at a distance. How hard could it be, after all everyone in Africa seems to be on Whats App? 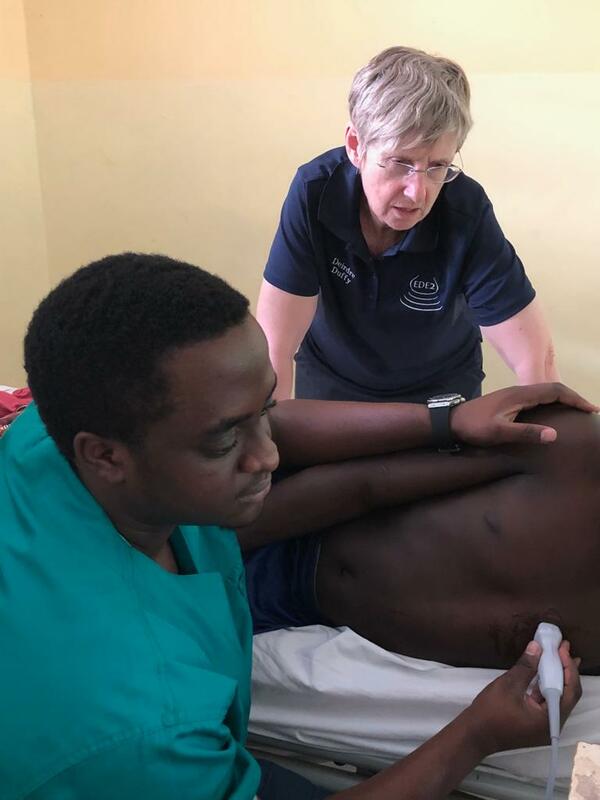 The CPOCUS outreach award will fund one of the Arusha instructors to travel to Nairobi to teach with us. That should be fun, having a Tanzanian telling a Kenyan what to do. 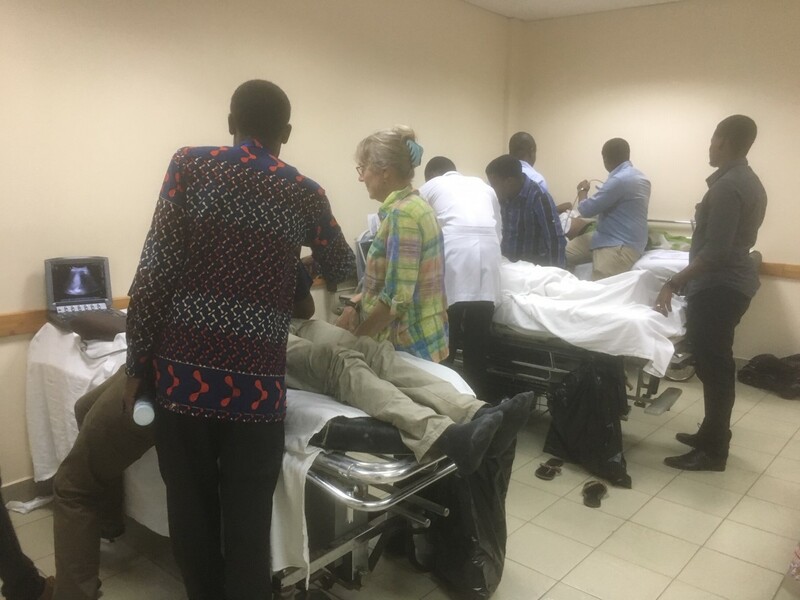 Meanwhile back in Arusha, the obstetric department wants in on the whole POCUS act and so we are looking at possibilities for a third trimester OB course. 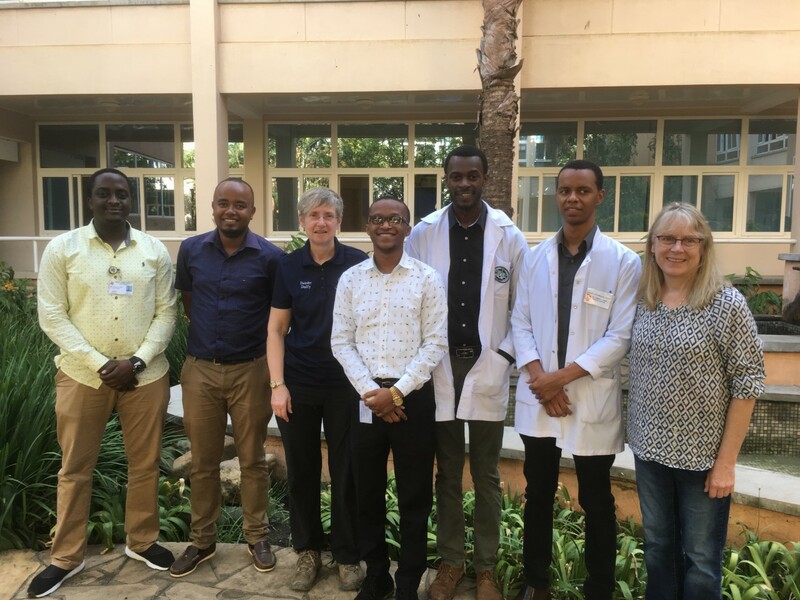 Oh, and I heard there is a possibility that some clinicians might come to Arusha from the Rwandan refugee camps and DRC for training so we might have to look for some Francophones in need of a safari holiday with a small EDE CME add-on. But I think I’m done with volcanoes for now. Maybe diving in Zanzibar? OK, for those of you who like to tie up loose ends, what about those crash victims? Well the pilot got away with a cast for his lower leg fracture, which healed long before his feelings of guilt. The Dutch physiotherapist had a nasty fracture dislocation of his shoulder which he took home to the shoulder surgeon he worked with! The two Dutch medical students with chest and pelvic injuries won another, all-expenses-paid, flight home but this time above the turbulence with oxygen and analgesia. The Tanzanian Medical Officer recovered from his head injury, had his face put back together by a visiting maxillofacial surgeon and is now back at work in Maasailand, where he can sometimes be found seeing patients in the shade of the wing of the replacement Cessna 206 that someone gave to Pat. So they all lived happily ever after. And, I overheard Pat, last month, tell someone that we have known each other for years but he can’t remember how we first met!